Sir Nicholas George Winton MBE (born Wertheim; 19 May 1909 – 1 July 2015) was a British humanitarian who organised the rescue of 669 children, most of them Jewish, from Czechoslovakia on the eve of World War II in an operation later known as the Czech Kindertransport (German for "children's transport"). Winton found homes for the children and arranged for their safe passage to Britain. The world found out about his work over 50 years later, in 1988. The British press dubbed him the "British Schindler". In 2003, Winton was knighted by Queen Elizabeth II for "services to humanity, in saving Jewish children from Nazi Germany occupied Czechoslovakia". On 28 October 2014, he was awarded the highest honour of the Czech Republic, the Order of the White Lion (1st class), by Czech President Miloš Zeman. He died in 2015 at the age of 106. Winton was born on 19 May 1909 in Hampstead, London to Rudolph Wertheim (1881–1937), a bank manager, and his wife Barbara (née Wertheimer, 1888–1978), as the middle-born of their three children. His elder sister was Charlotte (1908–2001) and the younger brother, Robert (1914–2009). His parents were German Jews who had moved to London two years earlier. The family name was Wertheim, but they changed it to Winton in an effort at integration. They also converted to Christianity, and Winton was baptised. In 1923, Winton entered Stowe School, which had just opened. He left without qualifications, attending night school while volunteering at the Midland Bank. He then went to Hamburg, where he worked at Behrens Bank, followed by Wasserman Bank in Berlin. In 1931, he moved to France and worked for the Banque Nationale de Crédit in Paris. He also earned a banking qualification in France. Returning to London, he became a broker at the London Stock Exchange. Though a stockbroker, Winton was also "an ardent socialist who became close to Labour Party luminaries Aneurin Bevan, Jennie Lee and Tom Driberg." Through another socialist friend, Martin Blake, Winton became part of a left-wing circle opposed to appeasement and concerned about the dangers posed by the Nazis. At school, he had become an outstanding fencer and he was selected for the British team in 1938. He had hoped to compete in the next Olympics, but the games were cancelled because of the war. Jewish children leave Prague for Britain. Winton appears towards the end of the video, wearing glasses. Shortly before Christmas 1938, Winton was planning to travel to Switzerland for a skiing holiday. He decided instead to visit Prague and help Martin Blake, who was in Prague as an associate of the British Committee for Refugees from Czechoslovakia, then in the process of being occupied by Germany, and had called Winton to ask him to assist in Jewish welfare work. Winton established an organization to aid children from Jewish families at risk from the Nazis. He set up his office at a dining room table in his hotel in Wenceslas Square. In November 1938, following Kristallnacht in Nazi-ruled Germany, the House of Commons approved a measure to allow the entry into Britain of refugees younger than 17, provided they had a place to stay and a warranty of £50 was deposited for their eventual return to their own country. An important obstacle was getting official permission to cross into the Netherlands, as the children were to embark on the ferry at Hook of Holland. After Kristallnacht in November 1938, the Dutch government officially closed its borders to any Jewish refugees. The border guards, marechaussees, searched for them and returned any found to Germany, despite the horrors of Kristallnacht being well known. Winton succeeded, thanks to the guarantees he had obtained from Britain. After the first train, the process of crossing the Netherlands went smoothly. Winton ultimately found homes in Britain for 669 children,[page needed] many of whose parents would perish in the Auschwitz concentration camp. His mother worked with him to place the children in homes and later hostels. [page needed] Throughout the summer of 1939, he placed photographs of the children in Picture Post seeking families to accept them. He also wrote to US politicians such as Roosevelt, asking them to take more children. He said that two thousand more might have been saved if they had helped, but only Sweden took any besides those sent to Britain. The last group of 250, scheduled to leave Prague on 1 September 1939, were unable to depart. With Hitler's invasion of Poland on the same day, the Second World War had begun. Of the children due to leave on that train, only two survived the war. Of the 669 children saved from the Holocaust through Winton's efforts, more than 370 have never been traced. BBC News suggested in 2015 that they may not know the full story of how they survived the war. After the outbreak of the World War II, Winton applied successfully for registration as a conscientious objector and later served with the Red Cross. In 1940, he rescinded his objections and joined the Royal Air Force, Administrative and Special Duties Branch. He was an aircraftman, rising to sergeant by the time he was commissioned on 22 June 1944 as an acting pilot officer on probation. After the war, Winton worked for the International Refugee Organization and then the International Bank for Reconstruction and Development in Paris, where he met Grete Gjelstrup, a Danish secretary and accountant's daughter. They married in her hometown of Vejle on 31 October 1948. The couple settled in Maidenhead, England, where they brought up their three children: Nick (born 1951), Barbara (born 1954) and the youngest Robin (1956–62), who was born with Down syndrome. The family insisted that Robin stay with them rather than be sent to a residential home. Robin's death from meningitis, the day before his sixth birthday, affected Winton greatly and he founded a local support organisation which became Maidenhead Mencap. Winton stood, unsuccessfully, for the town council in 1954; he later found work in the finance departments of various companies. It has been reported that Winton suppressed his humanitarian exploits for many years; however, he mentioned them in his election material while unsuccessfully standing for election to the Maidenhead town council in 1954. His rescue achievements went unnoticed for half a century until in 1988 his wife found a detailed scrapbook in their attic, containing lists of the children, including their parents' names and the names and addresses of the families that took them in. She gave the scrapbook to Elisabeth Maxwell, a Holocaust researcher and wife of media magnate Robert Maxwell. Winton himself could not remember the reason why this was done. Letters were sent to each of these known addresses and 80 of "Winton's children" were found in Britain. In an interview on BBC radio program The Life Scientific, Simon Wessely described how his father Rudi, one of the rescued children, had a chance encounter with Winton. The wider world found out about his work in February 1988 during an episode of the BBC television programme That's Life! when he was invited as a member of the audience. At one point, Winton's scrapbook was shown and his achievements were explained. The host of the programme, Esther Rantzen, asked whether anybody in the audience owed their lives to Winton, and if so, to stand – more than two dozen people surrounding Winton rose and applauded. To celebrate his 100th birthday, Winton flew over the White Waltham Airfield in a microlight piloted by Judy Leden, the daughter of one of the boys he saved. His birthday was also marked by the publication of a profile in The Jewish Chronicle. Winton died in his sleep on the morning of 1 July 2015 at Wexham Park Hospital in Slough from cardio-respiratory failure, having been admitted a week earlier following a deterioration in his health. He was 106 years old. Winton's death came 76 years to the day after 241 of the children he saved left Prague on a train. A special report from the BBC News on several of the children whom Winton rescued during the war had been published earlier that day. In the 1983 Queen's Birthday Honours, Winton was appointed a Member of the Order of the British Empire (MBE) for his work in establishing the Abbeyfield homes for the elderly in Britain, and in the 2003 New Year Honours, he was knighted in recognition of his work on the Czech Kindertransport. He met the Queen again during her state visit to Bratislava, Slovakia, in October 2008. In 2003, Winton received the Pride of Britain Award for Lifetime Achievement. In 2010, Winton was named a British Hero of the Holocaust by the British Government. Winton was awarded the Order of Tomáš Garrigue Masaryk, Fourth Class, by the Czech President Václav Havel in 1998. In 2008, he was honoured by the Czech government in several ways. An elementary school in Kunžak is named after him, and he was awarded the Cross of Merit of the Minister of Defence, Grade I. The Czech government nominated him for the 2008 Nobel Peace Prize. Winton was baptised as a Christian by his parents, but his Jewish ancestry disqualified him from being declared a Righteous Among the Nations by Yad Vashem in Israel. As an adult, he was not active in any particular religion. In a 2015 interview, Winton told Stephen Sackur he had become disillusioned with religion during the war as he could not reconcile religious movements "praying for victory on both sides of the same war". Winton went on to describe his personal beliefs: "I believe in ethics, and if everybody believed in ethics we'd have no problems at all. That's the only way out; forget the religious side." Winton received the Wallenberg Medal on 27 June 2013 in London. The following year, the International Raoul Wallenberg Foundation established a literary competition named after Winton. The contest is for essays by high school students about Winton's legacy. On 1 September 2009, a special "Winton Train" composed of one or two steam locomotives (out of a set of six) and carriages used in the 1930s set off from the Prague Main railway station for London via the original Kindertransport route. On board were several surviving "Winton children" and their descendants, who were welcomed by Winton in London. The occasion marked the 70th anniversary of the intended last Kindertransport arranged by Winton, due to set off on 1 September 1939 but prevented by the outbreak of the Second World War that very day. At the train's departure, a memorial statue for Winton, designed by Flor Kent, was unveiled at the railway station. On 19 May 2014, Winton's 105th birthday, it was announced he was to receive the Czech Republic's highest honour, for giving Czech children "the greatest possible gift: the chance to live and to be free". On 28 October 2014, Winton was awarded the Order of the White Lion (Class I) by Czech President Miloš Zeman, the Czech Defence Ministry having sent a special aircraft to bring him to Prague. The award was made alongside one to Sir Winston Churchill, which was accepted by his grandson Nicholas Soames. Zeman said he regretted the highest Czech award having been awarded to the two personalities so belatedly, but added "better late than never". Winton was also able to meet some of the people he rescued 75 years earlier, themselves then in their 80s. He said, "I want to thank you all for this enormous expression of thanks for something which happened to me nearly 100 years ago—and a 100 years is a heck of a long time. I am delighted that so many of the children are still about and are here to thank me." Winton's work is the subject of three films by Slovak filmmaker Matej Mináč: the drama All My Loved Ones (1999), in which Winton was played by Rupert Graves, the documentary The Power of Good: Nicholas Winton (Síla lidskosti—Nicholas Winton, 2002), which won an Emmy Award, and the documentary drama Nicky's Family (Nickyho rodina, 2011). A play about Winton, Numbers from Prague, was performed in Cambridge in January 2011. Winton was featured in the 2000 Warner Brothers documentary written and directed by Mark Jonathan Harris and produced by Deborah Oppenheimer, Into the Arms of Strangers: Stories of the Kindertransport, which received the Academy Award for Best Documentary Feature, and the film's accompanying book of the same name. Speaking on BBC Radio 4's Today programme, on 28 October 2014, Winton said he thought he had "made a difference to a lot of people" and went on to say, "I don't think we've learned anything… the world today is in a more dangerous situation than it has ever been." On 22 April 2016, a remembrance quarter peal was rung and a new method named Sir Nicholas Winton Delight by bellringers of the Whiting Society of Ringers. On 19 May 2016, a memorial service for Winton was held at London's Guildhall, attended by some 400 people, including 28 of those he saved, and Czech, Slovak and UK government representatives. On 20 May 2016, military charity Glen Art presented a memorial concert celebrating Winton's life with Jason Isaacs, Rupert Graves and Alexander Baillie, at St John's, Smith Square. All funds donated were given to charities supporting Syrian refugee children. On 14 July 2017, a memorial garden for Winton was opened in Maidenhead Oaken Grove park by PM Theresa May. There is a stained glass memorial in the garden of the Grand Synagogue, Budapest, Hungary. ^ "Sir Nicholas Winton, A Man of Courage". Denmark: Auschwitz. 2008. Retrieved 3 September 2009. ^ a b "Statue for 'British Schindler' Sir Nicholas Winton". BBC News. 18 September 2010. Retrieved 18 September 2010. ^ a b "No. 56797". The London Gazette (Supplement). 31 December 2002. p. 2. ^ a b c "Ægteviede" [Married]. Kirkebog [Parish Register] (photogram). 1946–1955 (in Danish). Vor Frelsers Sogn (Vejle Kommune) [de]. 31 October 1948. p. 67. See No. 78. ^ Bates, Stephen (1 July 2015). "Sir Nicholas Winton obituary". The Guardian. London: Guardian Media Group. Retrieved 1 July 2015. ^ "Nicholas Winton and the Rescued Generation: Save One Life, Save the World – Muriel Emanuel, Vera Gissing". 27 August 2008. Retrieved 1 July 2015. ^ a b c "Winton bio". Winton Train. České drahy. 2008. Archived from the original on 9 September 2009. ^ "Index entry". FreeBMD. ONS. Retrieved 30 April 2011. ^ "Profile: Nicholas Winton". BBC News. BBC. 28 August 2009. ^ "The official opening of Stanhope House". Stowe School. 6 March 2009. Archived from the original on 18 July 2011. Retrieved 3 September 2009. ^ a b c d e Moss, Stephen (9 November 2014). "'British Schindler' Nicholas Winton: I wasn't heroic. I was never in danger". The Guardian. Retrieved 30 December 2014. ^ "Nicholas Winton and the Rescue of Children from Czechoslovakia, 1938–1939". Holocaust Encyclopedia. United States Holocaust Memorial Museum. ^ "Nicholas Winton, the Schindler of Britain". auschwitz.dk. 2008. Archived from the original on 7 February 2014. Retrieved 3 September 2009. ^ Baruch Tenenbaum. "Nicholas Winton, British savior". IRWF. The International Raoul Wallenberg Foundation. Retrieved 3 September 2009. ^ "Sir Nicholas Winton: How One Man Saved So Many Lives". Flashbak. 23 November 2013. Retrieved 1 July 2015. ^ a b c Lahav, Yehuda; Nir Hasson (2 September 2009). 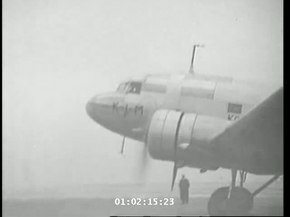 "Jews saved by U.K. stockbroker to reenact 1939 journey to safety". Haaretz. Archived from the original on 7 October 2009. Retrieved 3 September 2009. ^ a b "Sir Nicholas Winton – A remarkable living legend". The Jerusalem Post. 18 May 2015. Retrieved 1 July 2015. ^ "Vera Gissing Interview". Retrieved 26 March 2018. ^ a b Chadwick, William (2010). The Rescue of the Prague Refugees 1938–39. Matador. ISBN 978-1-84876-504-7. ^ "The Nicholas Winton Kindertransport Myth Comes Off the Rails - The Occidental Observer - White Identity, Interests, and Culture". ^ "Bill Barazetti - Local Hero". ^ Grenville, Anthony (April 2011). "Doreen Warriner, Trevor Chadwick and the 'Winton children'" (PDF). Association of Jewish Refugees Journal. 11 (4): 1–2. ^ a b "Nicholas Winton's children: The Czech Jews rescued by 'British Schindler'". BBC News. 1 July 2015. Retrieved 1 July 2015. ^ "No. 36633". The London Gazette (Supplement). 28 July 1944. p. 3562. ^ "No. 36681". The London Gazette (Supplement). 29 August 1944. p. 4071. ^ "No. 36963". The London Gazette (Supplement). 27 February 1945. p. 1202. ^ "No. 40315". The London Gazette (Supplement). 27 February 1945. p. 6205. ^ a b c d Moss, Stephen (9 November 2014). "'British Schindler' Nicholas Winton: I wasn't heroic. I was never in danger". The Guardian. Retrieved 28 July 2015. 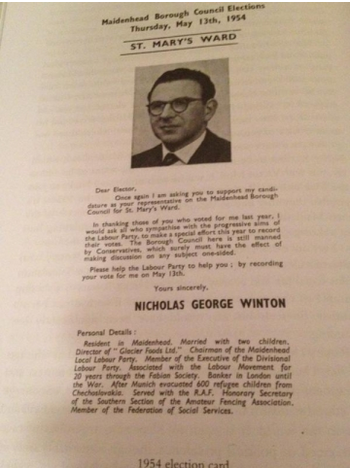 ^ "Nicholas George Winton Election Material 1954". Retrieved 28 July 2015. ^ "Interview to Barbara Winton, daughter of Sir Nicholas Winton. London, 27 June 2013". YouTube. The International Raoul Wallenberg Foundation. Retrieved 29 July 2015. ^ John Miles (7 March 2015). "Winton's Children: Saved From The Holocaust By 'Britain's Schindler'". Newsweek. Retrieved 22 February 2017. ^ a b c "Film documents 'power of good'". Jewish News of Greater Phoenix. Jewishaz.com. Archived from the original on 19 September 2008. Retrieved 1 September 2009. ^ "Simon Wessely on unexplained medical syndromes, The Life Scientific - BBC Radio 4". BBC. Retrieved 2019-01-16. ^ "The Power of Good". Archived from the original on 19 November 2013. ^ "'UK Schindler' in birthday flight". BBC News. 29 June 2009. Retrieved 1 September 2009. ^ Porter, Monica (14 May 2009). "Sir Nicholas Winton: A reluctant Holocaust hero". The Jewish Chronicle. Retrieved 20 December 2009. ^ a b "Sir Nicholas Winton, who saved hundreds of children from Nazi persecution, dies aged 106". Maidenhead Advertiser. 1 July 2015. Archived from the original on 2 July 2015. Retrieved 1 July 2015. ^ Koppel, Naomi (1 July 2015). "Kindertransport Organizer Nicholas Winton Dies at 106". ABC News. Retrieved 1 July 2015. ^ "'British Schindler' Sir Nicholas Winton dies aged 106". BBC News. 1 July 2015. Retrieved 1 July 2015. ^ Robert D. McFadden (1 July 2015). "Nicholas Winton, Rescuer of 669 Children From Holocaust, Dies at 106". The New York Times. Retrieved 2 July 2015. ^ "No. 49375". The London Gazette (Supplement). 10 June 1983. p. 17. ^ "Slovaks welcome Queen to capital". BBC News. 23 October 2008. Retrieved 3 September 2009. ^ "Lifetime Achievement: Sir Nicholas Winton". 2003. Retrieved 9 November 2016. ^ "Britons honoured for holocaust heroism". The Daily Telegraph. London. 9 March 2010. Archived from the original on 9 March 2010. Retrieved 9 March 2010. ^ "List of holders of the Tomas Garrigue Masaryk Order". Prague Castle site. Office of the President of the Czech Republic. Retrieved 3 September 2009. ^ a b c "Sir Nicholas Winton in the Czech Republic". Ministry of Defense, Czech Republic. 2 July 2008. Retrieved 5 September 2009. ^ "UK | UK's 'Schindler' awaits Nobel vote". BBC News. 1 February 2008. Retrieved 1 September 2009. ^ "JPL Small-Body Database Browser". JPL Small-Body Database. Jet Propulsion Laboratory. 2 October 2003. Retrieved 11 January 2009. ^ Dáin & Olík; sfwife (20 January 2011). "Sir Nicholas Winton statue, Praha, CZ". Waymarking. Groundspeak. Retrieved 19 November 2013. Quick Description: Bronzova socha Sira Nicholase Wintona a dvou deti / Bronze statues of Sir Nicholas Winton and two children. ^ "Survivors gather to pay tribute to 'British Schindler'". The Independent. 1 September 2009. Retrieved 9 November 2016. ^ "Kindertransport – the arrival Memorial". n.d. Retrieved 13 March 2015. ^ "Nicholas Winton". Jewishvirtuallibrary.org. Retrieved 1 September 2009. ^ "Profile: Nicholas Winton". BBC News. 28 August 2009. Retrieved 30 December 2014. ^ "Sir Nicholas Winton Home Page". Nicholaswinton.com. Retrieved 1 July 2015. ^ Simon, Bob (Correspondent) (27 April 2014). Saving the Children (Television Production Transcript). 60 Minutes. CBS News. Retrieved 19 May 2016. ^ a b "Sir Nicholas Winton at 105: the man who gave 669 Czech children the 'greatest gift'". The Daily Telegraph. 21 May 2014. ^ "White Lion goes to Winton and Winston". The Prague Post. 28 October 2014. ^ "Nicholas Winton honoured by Czechs for saving children from Nazis". BBC News. ^ "Všichni moji blízcí (1999)". Internet Movie Database. Retrieved 1 September 2009. ^ "Síla lidskosti – Nicholas Winton (2002)". Internet Movie Database. Retrieved 1 September 2009. ^ "Numbers from Prague". Keystage. 2011. ^ The European Association for Jewish Culture, 2010 theatre grant awards. ^ "Sir Nicholas Winton: I've made a difference". BBC News. ^ Rowe, Alan (25 April 2016). "Ringing World BellBoard". bb.ringingworld.co.uk. Retrieved 8 May 2016. ^ "Nicholas Winton memorial service honours Holocaust hero". 19 May 2016 – via www.bbc.com. ^ "Concert celebrating Sir Nicholas Winton to raise funds for Syrian refugees". Jewish News. 16 March 2016. ^ "Birmingham musicians honour 'British Schindler'". Royal Birmingham Conservatoire. 6 May 2016. ^ "CONCERT CELEBRATING SIR NICHOLAS WINTON TO RAISE FUNDS FOR SYRIAN REFUGEES". Glen Art. 20 May 2016. ^ "Sir Nicholas Winton memorial garden" – via advertiser.co.uk. "Breakfast With Frost: Interview with Nicholas Winton & Alfred Dubs". BBC Breakfast. 5 January 2003. "Retracing a life-saving journey". BBC News. 31 August 2009. This page is based on the Wikipedia article Nicholas Winton; it is used under the Creative Commons Attribution-ShareAlike 3.0 Unported License (CC-BY-SA). You may redistribute it, verbatim or modified, providing that you comply with the terms of the CC-BY-SA.